When selecting, installing, and maintaining sediment control Best Management Practices (BMPs), understanding the principles of sediment control will help us make better choices at construction sites. This is helpful to avoid complaints from neighbors and enforcement from regulators. It also makes sense to proactively control sediment in our efforts to protect our shared waterways. 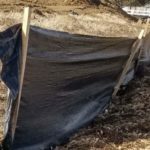 So read on, and see how these basic can help you run a cleaner site and a more effective stormwater program. Sediment is loose particles of soil (we warned you this would be basic!). We want to control them so they don’t pollute our streams and rivers and so they don’t clog up our streets, storm drains, and ponds. At construction sites, we use various types of sediment control, often at the project perimeter, to contain these “mobilized” soil particles. Examples are silt fence, straw wattle, detention ponds, inlet protection, and various track out BMPS at construction site exits. This is just a partial list. 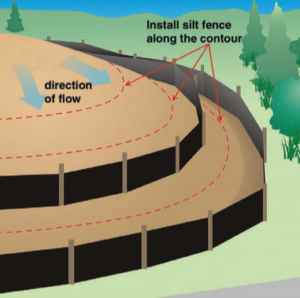 Among the most common sediment control applications are “Perimeter Control” measures like silt fence or straw wattle. For these situations, a sediment control BMP is placed at the downhill limits of construction to capture sediment before it is able to travel off site and impact neighboring properties or nearby waterways. This is where some basic principles can help us make good decisions. First, note that we are talking about soil particles carried down slope by stormwater. At the risk of being too obvious, the best place to locate these BMPs is at the toe of a slope (where the slope ends on flat ground). Alternatively, place sediment control on a contour so that water does not simply bypass the BMPs. So proper location is the first takeaway we want our readers to consider. Second, because the sediment is waterborne, it pays to take advantage of ponding. To understand the ponding effect, imagine a glass jar with muddy water, and imagine that it sat undisturbed for several hours. After an hour the heaviest particles would have settled to the bottom of the jar. Each passing hour would result in more and more settling. 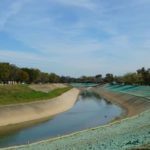 Sediment control BMPs that hold, or contain, water for longer periods are more effective at allowing sediment to settle out of the surface water that is carrying it. This happens in a controlled location so that we can maintain the site by removing accumulated sediment when things dry out after a storm event. Fourth, it is recommended by the EPA and design professionals to incorporate redundancy in your sediment control design. If your entire site funnels down to a low spot with a single BMP, then one point of failure can be disastrous. Installing a series of multiple lines of defense can avoid this all or nothing approach. Time to wrap up, since this is just a basic introduction, but let’s first mention a couple of things NOT to do, given these basics of sediment control. Do not place perimeter control at the top of a slope. It is wasted time and effort and unless you are trying to limit vehicle traffic, there is no reason for it. 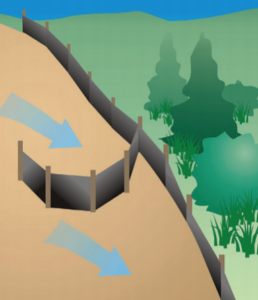 Do not place perimeter sediment control so it runs down a slope, This will allow water to flow by with no ponding effect. It just diverts water and the sediment carried in it. 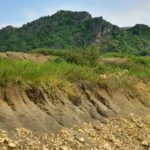 Worse yet, it may accelerate and concentrate the water flow, causing even more sediment to be carried further down slope. Use of J-hooks can help, but this is just not a great way to use sediment control. Do not allow your sediment control BMP to be undercut by water. Proper installations will bury or embed the bottom of the silt fence or wattle so water does not bypass it by flowing under. The ponding effect will be eliminated if the BMP is undercut. The concepts shared here truly are basics, but we see examples of poorly located and poorly installed sediment control frequently. 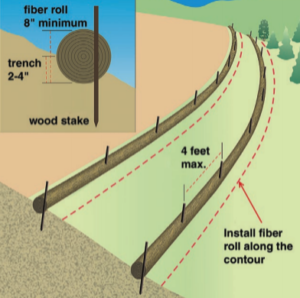 We hope that this post will help buyers of sediment control BMPs get their money’s worth from every installation. When it comes to quality installations of BMPs, you can Trust DTEC to get it right the first time. Please call us for your next project, we would be honored to serve you.